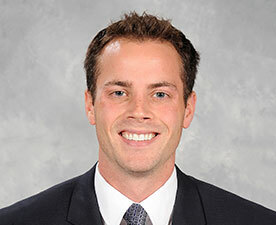 Dan Hursh joined True North Sports + Entertainment as Associate General Counsel in September 2011. He became the organization’s General Counsel in June 2014 before being named VP, AHL Operations & General Counsel in May 2015 when the Manitoba Moose returned to Winnipeg. Over three seasons, Hursh helped lead the successful reintroduction of Moose hockey to Winnipeg and oversaw all business matters pertaining to the Jets’ AHL affiliate. In the summer of 2018, Hursh turned his focus exclusively to legal matters and other business initiatives pertaining to True North and its subsidiaries as VP & General Counsel. Prior to joining True North, Hursh practiced law with a leading national law firm in Calgary, AB. Hursh earned a Bachelor of Arts in Political Science while playing four years of NCAA hockey at Princeton University and obtained his law degree from the University of Calgary. Hursh also serves as a board member for the Assiniboine Park Conservancy.